Adventures in the Endless Pursuit of Entertainment: Angela vs Angela: It's a tie! 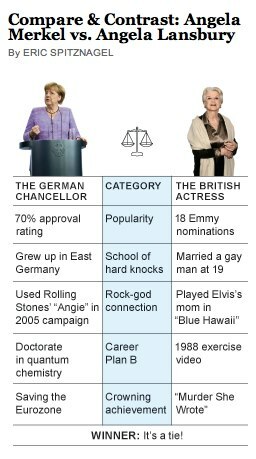 Angela vs Angela: It's a tie! Note: Although I love it, I do not consider Murder, She Wrote to be Angela Lansbury's "crowning achievement." I consider it her stage career, where she has thrilled audiences regularly since the late 1950s, and especially in Mame, Dear World, Gypsy, Sweeney Todd, and specifically me in person, in Deuce, Blithe Spirit, A Little Night Music and The Best Man. She may have garnered 18 Emmy and 3 Oscar nominations, but she earned 5 Tony Awards, four for Best Actress in a Musical.